The latest study from the American Society for Aesthetic Plastic Surgery (ASAPS) found that more than half of Americans now approve of cosmetic enhancement. Dr. Michael Schwartz says social media communities such as Facebook at his Thousand Oaks plastic surgery practice, and across the nation has likely played a role in this increase in popularity. 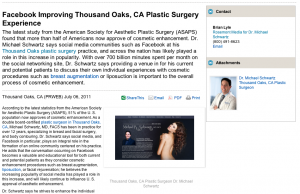 With over 700 billion minutes spent per month on the social networking site, Dr. Schwartz says providing a venue in for his current and potential patients to discuss their own individual experiences with cosmetic procedures such as breast augmentation or liposuction is important to the overall process of cosmetic enhancement. According to the latest statistics from the American Society for Aesthetic Plastic Surgery (ASAPS), 51% of the U. S. population now approves of cosmetic enhancement. As a double board-certified plastic surgeon in Thousand Oaks, CA, Michael Schwartz, MD, FACS has been in practice for over 12 years, specializing in breast and facial surgery, and body contouring. Dr. Schwartz says social media, and Facebook in particular, plays an integral role in the formation of an online community centered on his practice. He adds that the conversation occurring on Facebook becomes a valuable and educational tool for both current and potential patients as they consider cosmetic enhancement procedures such as breast augmentation, liposuction, or facial rejuvenation; he believes the increasing popularity of social media has played a role in this increase, and will likely continue to influence U. S. approval of aesthetic enhancement. Dr. Schwartz says he strives to enhance the individual aspects of each patient by balancing the artistic skill and technical expertise required of aesthetic enhancement. He says education plays an important role in the successful development of patient expectations. Dr. Schwartz adds that when he considers the significance of cosmetic enhancement decisions being made with the help of Facebook conversations, reviews, and testimonials, the benefits are hard to ignore. Whether his patients are discussing their own personal experience with plastic surgery procedures such as liposuction or BOTOX Cosmetic ®, posting testimonials, or searching for reviews, Dr. Schwartz says social media has become an innovative way for him and his practice to interact with patients online. As he continues to pursue positive patient experiences and seamless aesthetic enhancement results, Dr. Schwartz says sites such as Facebook are fast-becoming an essential and valuable online tool that will continue to increase the popularity of cosmetic procedures. Dr. Michael Schwartz earned his medical degree at Baylor College of Medicine. He then completed his general surgery residency at the University of Southern California, and his plastic surgery residency at the University of Texas Southwestern Medical Center. The American Board of Surgery and the American Board of Plastic Surgery have certified Dr. Schwartz. He is a fellow of the American College of Surgeons, and a member of the American Society of Plastic Surgeons, the American Society for Aesthetic Plastic Surgery, and the Los Angeles Society of Plastic Surgeons. Dr. Schwartz’ plastic surgery practice is located at 696 Hampshire Road, Suite 210 in Westlake Village, CA 91361, and can be reached at (805) 435-8256, or found online at www.drschwartz.com, or the Michael R. Schwartz, MD, FACS Facebook page.